When the field got down to 10 players, David Smith went down to as low as one and a half big blinds before making a chip-and-a-chair comeback to enter the official nine-handed final table third in chips. Then, Michael Frederick lost a flip with the against the to set the stage for the official final table. Heimiller lost the lead straight away after Donald Maas doubled up through him, and then iIn Hand #11, Jim Custer could not improve with the versus the and finished in ninth place. 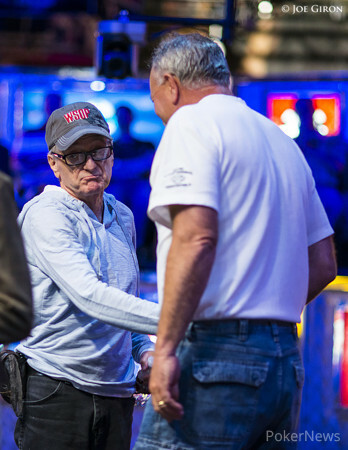 David Vida followed only eight hands later and Doc Barry busted on Hand #22 after being previously crippled by Anthony Wise. From there, it took only two more hands to reduce the field to five when David Tran lost the coin flip with the against the . Dennis Phillips finished second to Allyn Jaffrey Shulman in 2012 and he would have to settle for fifth this time after four-bet shoving with the into the of Maas. Exactly one hand later, Anthony Wise hit the rail in fourth place, which led to three-handed play carrying on for two hours. Both Heimiller and Maas put a lot of pressure on short stack David Smith, and the latter then bowed out on Hand #122 after losing a flip. Heimiller started the heads-up match with a 3-1 lead, and it only took six hands to determine the winner when Heimiller flopped a straight to send Maas out the door in second place. With the victory secured, Heimiller darted off to Event #22: $10,000 H.O.R.S.E. Championship where his late-reg stack was being blinded off. With a shining new gold bracelet wrapped around his wrist and $627,462 in prize money in his pocket, the rest of the night was all smiles for Heimiller as he worked his way through the rest of the $10,000 H.O.R.S.E. event. 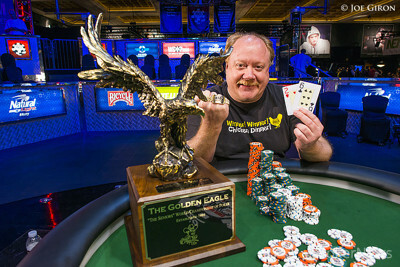 Congratulations to all of the winners from the record event, and especially to Dan Heimiller for becoming the 2014 WSOP Seniors Championship champion. Donald Maas completed the blind on the button and Dan Heimiller checked his option in the big blind. They saw a flop of and Mass called a raise to 600,000 from Heimiller. The turn card was the . Maas bet 500,000 and Heimiller called. The river completed the board. There was a bet of 300,000 from Heimiller and Mass moved all in. Heimiller instantly called and flipped over the for the flopped straight. Mass couldn’t beat it and he finished the tournament in second place making Heimiller the winner. Hand #123: Dan Heimiller opened for 300,000 and Donald Maas folded. Hand #124: Mass made it 360,000 and Heimiller folded showing . Hand #125: Heimiller called and Maas checked. Flop of . Both checked and the turn was the . Mass bet 300,000 and won the pot. 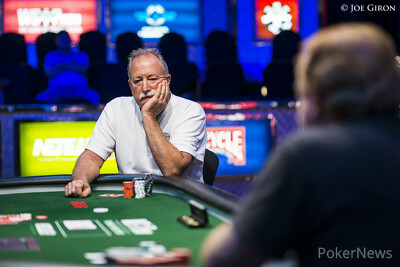 Hand #126: Maas limped and Heimiller raised to 320,000. Maas made the call. The flop was . Heimiller bet 350,000 and took it down. The players have been sent into a five minute break to set up the table for heads up play. Hand #122: Ronald Maas limped, Dan Heimiller filled up in the small blind and David Smith moved all in from the big blind. Maas quickly folded, but Heimiller took longer for his decision. He did make the call! The board bricked and Smith has been eliminated in third place for a payday of $279,412. Hand #121: Donald Maas raised the small blind to 250,000 and Dan Heimiller called to see the flop. Maas bet 400,000 and then folded when Heimiller raised to 900,000. Hand #115: Dan Heimiller limped the small blind. David Smith moved all in from the big blind and Heimiller folded. 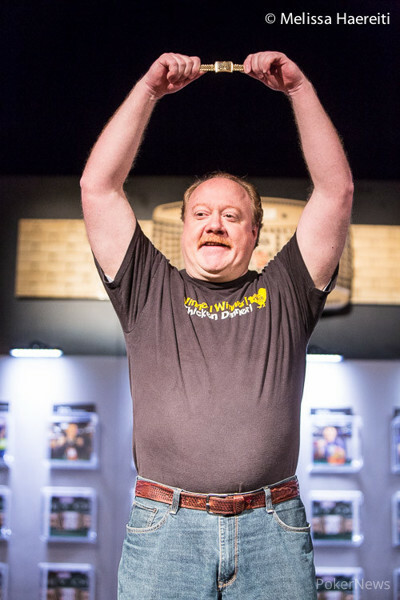 Hand #116: Dan Heimiller opened for 250,000. Smith folded and Maas called. The flop was . Maas checked and Heimiller bet 200,000. Mass let it go. Hand #117: Maas in the small blind raised to 260,000 and Heimiller called in the big blind. A flop of and both checked to see the turn . Checked again to the river . Maas bet 400,000 and Heimiller folded. Hand #118: Heimiller made it 300,000 and Smith called. The flop was . Smith bet 300,000 and Heimiller called. The on the turn and Smith bet 600,000. Smith won the pot. Hand #119: Heimiller made it 275,000 and took it down. Hand #120: Maas made it 250,000 and Heimiller called. The flop was . Maas bet 400,000 and Heimiller raised to 900,000. Maas folded. Hand #110: Limped pot to the flop and Dan Heimiller took down the pot with a bet. Hand #111: Heimiller raised to 300,000 and won the blinds and antes. Hand #112: David Smith raised to 400,000 and Heimiller moved all in, Smith folded. Hand #113: Smith moved all in and neither opponent called. Hand #114: Donald Maas raised to 285,000 out of the small blind and Heimiller folded in the big blind.